Found 4 file extension associations related to NBA LIVE and 3 file formats developed specifically for use with NBA LIVE. With more features, Electronic Arts brings basketball action (and control) as a new reality in your home. Why just watch when you can be in the game! NBA Elevate Your Game in NBA Live 08. With Total Freestyle Control, pull off moves only the pros perform as you replicate the playing styles of your favorite NBA players. Elevate to the rim for an electrifying dunk and bring the crowd to its feet, or look to your superstars to shift momentum with the game on the line. Featuring revolutionary gameplay, complete with ultra-realistic player moves and emotions, the hardwood is yours for the taking. 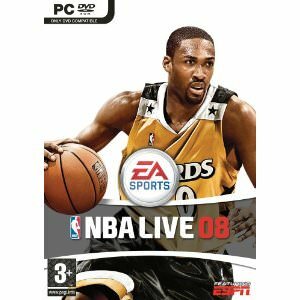 The cover of EA NBA Live 08 will feature Agent Zero (Gilbert Arenas). Analysts Greg Anthony and Ernie Johnson call the action as you showcase your skills in the Slam Dunk Contest and 3 Point Shootout Have your own NBA All-Star Weekend, with the Rookie Challenge and NBA All-Star Game Former Chicago Bulls star Steve Kerr joins the legendary Marv Albert court side -- together they call all the action from the best seats in the house. If you need more information please contact the developers of NBA LIVE (Electronic Arts, Inc.), or check out their product website.